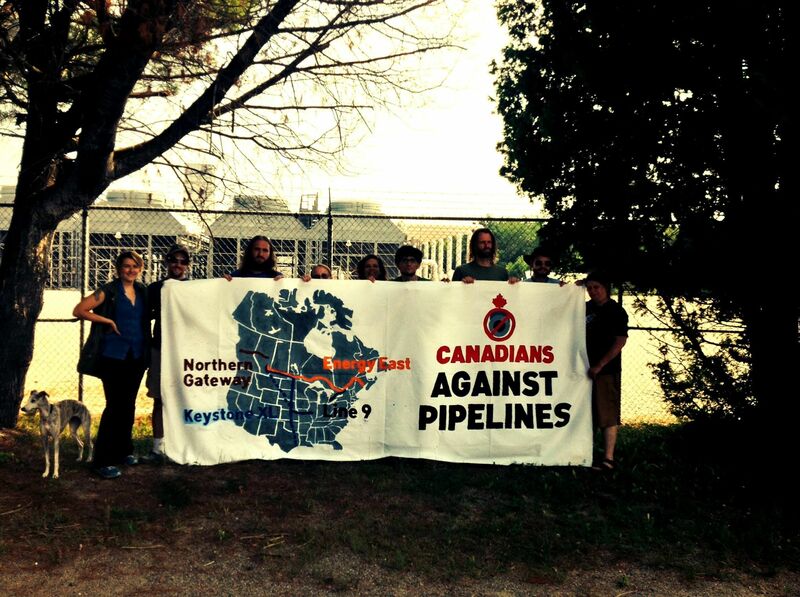 On August 10, activists from Toronto350, a branch of the 350.org network, visited the TransCanada gas compressor station in Bracebridge, Ontario. This compressor station is just one of scores of similar facilities that move natural gas along the length of the TransCanada mainline. The mainline is a major piece of pipeline infrastructure that transmits a large quantity of gas into Ontario's commercial distribution areas for Union Gas Limited, Enbridge Inc., and others. TransCanada is nearing the filing of a project application for their mainline conversion project "Energy East" with the National Energy Board. TransCanada has announced an intent to file--sometime between August and September 2014--for conversion of the pipeline from natural gas to heavy oil transmission. This conversion will mean years of new builds, infrastructure upgrades, and conversion of compressor stations to pump heavier oils. The project is intended to supply Irving family refineries in New Brunswick with up to 1.1 million barrels of oil per day. The Bracebridge station is not one of those compressor sites that will be overhauled to move oil, but it is on the southern loop of the natural gas mainline that passes down the Hwy. 11/400 corridor and supplies southern Ontario's commercial distributors Union Gas and Enbridge. On Monday, August 11, Union Gas was quoted in the Toronto Star, publicly expressing concern about the conversion of the mainline. They claim that it could result in a supply bottleneck leading to reduced availability of natural gas in Ontario, and higher prices. Union Gas referenced the need to build new infrastructure to match demand. TransCanada has proposed a new pipeline project running east, known as the Eastern Mainline project. The Eastern Mainline will connect Markham, Ontario, to Iroquois, Ontario, and will allow for the import of gas from the east. "The Eastern Mainline makes it increasingly likely that the shortfall in western natural gas caused by the mainline conversion will be met with the import of fracked shale gas from New Brunswick or the US northeast," says Kevin Metcalf, a campaigner with Toronto350. "At a time when 10% or more of our provincial gas needs can be met with renewable natural gas from methane capture, people have the right not to use fracked gas in their homes." Union Gas has expressed concern that the Eastern Mainline from Markham to Iroquois will be an expensive project. The cost of the Eastern Mainline is estimated at just over $2 billion and it follows a similar route to the contentious Enbridge Line 9 heavy oil pipeline. The costs of the Eastern Mainline project will likely be tied to an increase in tolls for the natural gas commodity, a cost which could be offloaded to Ontario's residential customers. In 2013, the National Energy Board rejected mainline transmission toll increases proposed by TransCanada, while the Ontario Energy Board approved Enbridge's 40% incremental rate-hike for residential customers in early 2014. The decline in supply seems to be creating a situation where eastern gas consumers will shoulder the costs of a western heavy oil pipeline. The costs of energy could potentially become even more expensive in Ontario as a corollary to shipping increased quantities of oil sands to market. Large pumping facilities will draw from the electricity grid and potentially affect the availability of power in northern Ontario. The Bracebridge station visit by Toronto350 was conducted as part of an ongoing Ontario-wide campaign, with citizens groups pitting themselves against pipeline projects. In Innerkip, near Woodstock, a group of protesters with "Dam Line 9" camped for six days, blocking work on an Enbridge work-site. Some of those protesters were arrested Sunday after the OPP served an injunction. Early Monday morning in Toronto, a group called the Community Response Unit for Decontaminating our Environment (CRUDE) temporarily occupied a pipeline construction site on the same route. Protesters are calling on the National Energy Board to consider climate change as part of their review process for pipeline projects as well as seeking enhanced environmental assessment from provincial bodies for certain projects. As commercial distributors like Union Gas express concern with the economic impacts of TransCanada's Energy East and as community groups continue to rally together against pipelines like Line 9, it seems less and less likely that TransCanada will win either the regulatory approval or the social license that they need to proceed with their oil sands pipeline project.